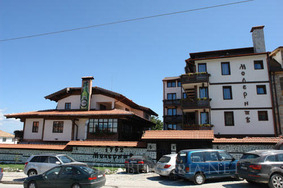 Molerite Hotel in Bansko mounatin and ski resort in Bulgaria. Book Molerite hotel online! -10% discount until 15 Nov 2017! Location: Complex Molerite is situated in the centre of Bansko. It is a perfect starting point for exploring the town and its environs regardless of the season. Complex Molerite invites the visitors of Bansko to stay a few nights in a place designed after the old Bulgarian traditions. The rooms in the hotel are tastefully decorated and offer all modern conveniences. Accommodation: Molerite hotel offers 25 double rooms and 5 comfortable apartments. The double rooms offer either two beds or one big bed. All of them are supplied with a TV set, telephone, mini bar, desk and central heating, en-suite bathroom with shower. The apartments provide the same facilities as the double rooms. Every apartment has a private bathroom with a bathtub or shower as well as a small living room. Wine& Dine: Molerite Tavern offer delicious dishes typical for the region, and can welcome up to 80 guests people. The creation of the tavern has been the first step of the creation of the complex. It has been conceived with the idea to turn into something grand and unique. Indeed, with the years passing by this intention has become reality and at present the tavern can seat up to two hundred people in the winter and twice more in the summer. An orchestra is performing in the tavern. Guests are offered the splendid opportunity to taste real wines from the most fruitful Bulgarian vineyards, to see a selection of wines collected for generations so today everyone will be able to enjoy them and appreciate the richness of the Bulgarian lands. Spa & Wellness: Molerite Hotel offers a modern spa centre, which offers professional massages, contemporary equipment and works with the most renowned spa cosmetics brands in the world. Complex Molerite is specializing in the organization and carrying out of wedding parties, VIP parties, cocktails, festivals and other activities. They also offer a variety of tours, which will satisfy the most discerning travelers and will leave everyone with lots of memories of wonderful experiences.